Coral Ridge is an upscale neighborhood in east Fort Lauderdale, Florida. Coral Ridge homes are located on the west side of the Intracoastal Waterway, between the major east/west arterial roadways of Sunrise Boulevard and Oakland Park Boulevard. 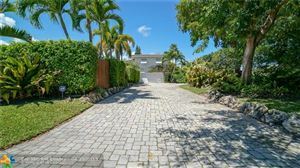 The area features a mixture of waterfront and dry lot homes, as well as the popular Coral Ridge Yacht Club and Marina. Running through the middle of Coral Ridge from the north to the south is Bayview Drive. Waterfront homes to the east of Bayview Drive have unobstructed access (no fixed bridges) to the Intracoastal Waterway, which leads directly to the Atlantic Ocean. Waterfront homes to the west of Bayview Drive are located on the Middle River. This waterway has fixed bridges that obstruct larger vessels from accessing the Intracoastal Waterway. However, smaller vessels can generally travel under the bridges without a problem. A popular feature of Coral Ridge is the abundance of single-family homes. Many of these homes are situated on larger lots, which are around 10,000 square feet. Coral Ridge homes are conveniently located within walking distance to parks, casual restaurants and shopping. Fort Lauderdale Beach, Downtown Fort Lauderdale, Galleria Mall, fine dining, golf courses, top-rated schools and more are only minutes away.